When Interpol first got together to begin working up the songs for their new (and sixth) studio album, Marauder, they convened at what guitarist Daniel Kessler recalls as a “godsend of a rehearsal space” in New York City. Where Interpol eventually went was upstate New York, where they recorded Marauder with producer Dave Fridmann (Flaming Lips, Mogwai) at his own Tarbox Road Studios. 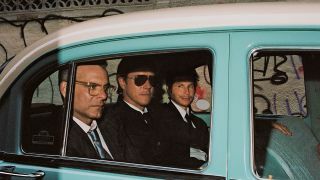 Though Interpol — Kessler, singer, guitarist and sometimes bassist Paul Banks and drummer Sam Fogarino — had self-produced their last two records, they found working with Fridmann to be a good fit. Interpol's brand-new album, Marauder, was released August 24 via Matador. Check out interpolnyc.com for more information about the band.